Need a Super Easy Dish to bring to a Super Bowl Party or are you having your own party? Make a Delicious Taco Ring! This one is easy and it is sure to be a crowd pleaser. This Taco Ring Recipe also makes a quick and easy dinner the kids will go nuts for. 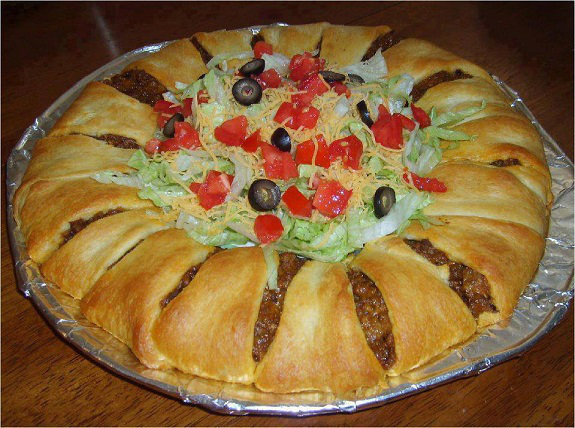 In fact, this taco ring recipe is so easy, the kids can make it with you. It starts with refrigerated crescent rolls. Top with seasoned ground beef and cheese, then bake. Serve taco style with lettuce, sour cream, salsa and other taco fixings.